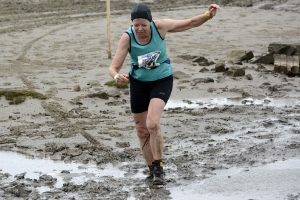 Lesley Pymm reports: 3 hours to run 13 miles – how hard can that be (especially as it was all going to be on the flat)? Well, I was to find out! This run goes across Morecambe Bay from Lancashire to Cumbria. 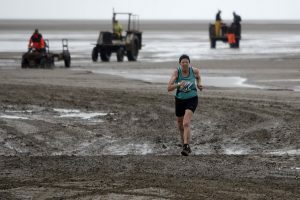 Originally it was to start at Hest Bank, but a few days before the event I had an email to say that the start had been changed owing to the sands shifting and it not being safe. Actually that turned out to be more suitable for us, as we were staying just up the road from the new start at Arnside YHA. We started from Gibralter Farm in Silverdale. It was due to start at 8.45 and I drove over and parked midway between the start and the railway station. I walked down to the start and hung around in the wind – it was very windy. Someone said that we were likely to start off late as the guides were having problems finding a safe crossing. I was getting very cold and starting to shiver. Eventually it was going to start. It was about 1/2 hour late starting, but they called the cyclists over first. Then it was the runners, and the walkers were to go afterwards as they were only doing about 7 miles. As we stepped from the shore and started to move over the sands, I suddenly felt very woozy and was worried that I really was hypothermic. I was very relieved when I heard someone behind me saying that she ‘felt drunk’. Then I realized that it must be something to do with the sand rather than me! The wind was howling from the north and we were heading – you’ve guessed it – north! I couldn’t move my head as I still felt a bit queasy. and couldn’t talk to anyone running near me as it was so windy that you couldn’t hear anything anyway. The first 8 miles or so was directly into the wind. At 4 miles, I glanced at my watch and found that I had taken an hour. If I carried on at that pace, I was not going to finish in the time. I was half looking forward to being rescued as that seemed quite exciting. There is not much to say about the course! It was firm sand, but there were some very wet bits. I found that running through water that came to mid calf was OK, when it got any deeper I needed to wade – and I waded faster than some others. I was surprised to find that I was passing some of the cyclists on those odd ‘fat boy’ bikes. That did look like hard work. The drink stations were at tractors every few miles. You had to stop as the cups had to be left at the station – Respect the Bay! After 8 miles we seemed to turn away from the wind slightly – it was still strong and made life difficult, but was not head on! Suddenly, at 10 miles I found that I was running with the wind behind me, yes – actually running! The final 3 miles were pretty strong, the only major problem was that there were pools and I kept dropping further in than I expected. I turned towards the finish and ran in. Mike was there at the finish having got the first train over from Arnside. Looking at my watch I had beaten 3 hours. In the marquee I managed to get my wet clothes off and then saw a couple of men I had been talking to at the beginning. One of them had been diverted at 8 miles – so he still showed on the results but had done a shorter course. He had ‘Beaten the Bay’. I don’t know how many were brought in on tractors. There were only a few runners behind me, so I must have just missed the cut at 8 miles. It was one of the hardest things I have ever done – yes, Suz, even harder than the Grizzly. At least with the Griz (which I have done in gale force winds) you get some respite. On this event there was no respite. They say this was the hardest one they have ever done, weather wise. This entry was posted in Half Marathon, Multi-terrain, Race Reports by Race Reports. Bookmark the permalink. well done Lesley , this does sound hard work. Maybe one for me to try next year! That was an evocative and compelling report, Lesley. I was with you out on the sands (mainly worrying about quicksand! ), keenly feeling that headwind. It isn’t easy in a few words to conjure up the conditions and the effort needed to plough on through them but you’ve captured them well and given us a real sense of place and person. Thank you! A sat-nav would have been useless, Barrie. This was one of the more expensive runs that I have entered and part of what I was paying for was the guides. They are professionals! I was carrying my fell running pack complete with emergency food and a jacket. I think Lesley,that I would have wanted wellingtons/waders + a buoyancy aid + a sat nav. to attempt such a venture + a food and drink pack (and maybe an inflatable dinghy in tow! ).